Priceline will acquire Kayak.com, the travel search company, for $1.8 billion, the company announced Thursday. The deal will be a combination of $500 million in cash and $1.3 billion in equity and options, close to a 30 percent premium on Thursday’s listed share price. “Kayak has built a strong brand in online travel research and their track record of profitable growth is demonstrative of their popularity,” Priceline CEO Jeffery Boyd said in a statement. 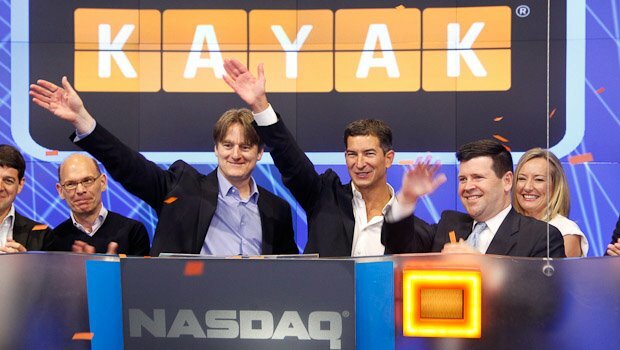 The acquisition comes only a matter of months after Kayak first listed itself on the Nasdaq exchange. Kayak was slated to post its third-quarter earnings today, only the second time ever for the newly public company. Last August, Kayak beat analyst expectations for earnings, posting revenue of $76.9 million — a 36 percent increase over the same period a year earlier — and net income totaling $7.3 million, or 19 cents a share, which is nearly double what it reported in the second quarter of 2011. Kayak.com will remain a separate property, owned by Priceline but managed by Kayak’s existing team. Shares of Priceline were trading down 11 points after hours, about a 2 percent drop to $616.32 per share. Shares of Kayak surged by 30 percent after hours, hitting an all-time high of $40.55 per share. NORWALK, Conn., Nov. 8, 2012 /PRNewswire/ — Priceline.com Incorporated (NASDAQ: PCLN) announced today that it has signed a definitive agreement for the Priceline Group to acquire KAYAK in a stock and cash transaction. Under the terms of the agreement, the transaction values KAYAK at $1.8 billion ($1.65 billion net of cash acquired) or $40 per share of KAYAK (subject to the collar described below), with the Group paying approximately $500 million of the consideration in cash and $1.3 billion in equity and assumed stock options.